As the weather slowly gets warmer, one of the brightest and most spectacular natural events is occurring in our region. Several of our most spectacular flowering plants are doing just that – flowering, providing us with rich sights and smells and an important source of food for our native wildlife. 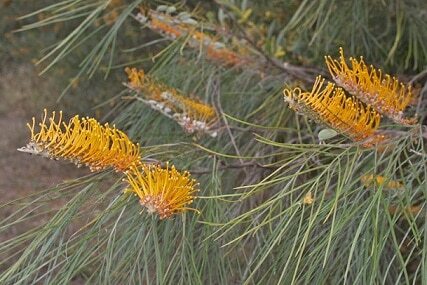 Golden Bouquet Tree (Deplanchea tetraphylla): Australia’s only Deplanchea are slender trees that grow to 20 metres. They are found mainly in coastal areas in rainforest and adjacent habitats. They have large, smooth, leathery egg-shaped dark green leaves with golden woolly hairs underneath. Their spectacular yellow flowers are about the size of dinner plates and produce large quantities of nectar, attracting wildlife such as birds and butterflies. 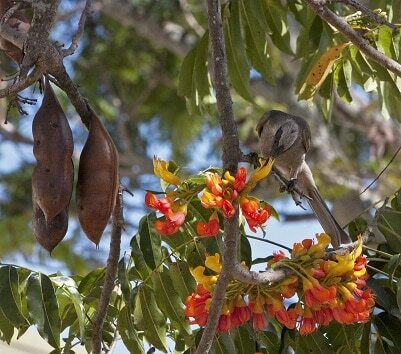 Black Bean (Castanospermum australe): These large, straight trunked trees grow up to 35 metres and are occur in rainforest and adjacent habitats. They have a grey to brown smooth trunk and glossy, dark green leaves. Their pea-shaped, reddish-yellow flowers are spectacular and develop on the major branches. 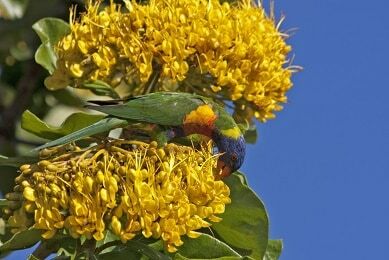 Flowers are an excellent source of food for many birds, possums and flying foxes. After flowering, large woody seed pods develop. 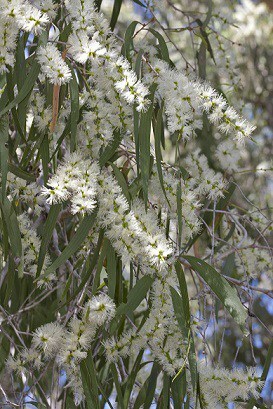 Weeping Paperbark (Melaleuca leaucadendra): Large, spreading and distinctive weeping trees up to 30 metres tall. They are common in many different habitats alongside watercourses and seasonally wet areas. The layered, papery bark is creamy-white to grey, while the smooth, dull, dark leaves are narrow and taper to a point. Flowering is often with massive showy displays of cream to cream-green flowers on open cylindrical spikes. The rich nectar attracts a whole range of wildlife. 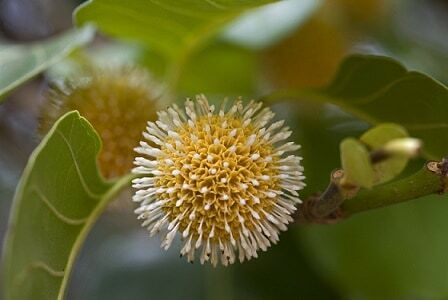 Golden Penda (Xanthostemon chrysanthus): The floral emblem of Cairns, these medium-sized trees grow up to 10 metres high and are primarily rainforest plants, but also grow alongside watercourses. They are, however, also widely grown as a cultivated plant throughout the region. They have shiny, stiff dark green leaves and rough, scaly bark. 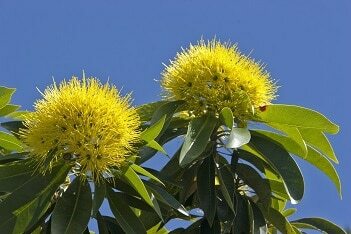 Flowering is also spectacular with large heads of bright golden-yellow fluffy flowers on the ends of their branches. A whole range of wildlife including birds, butterflies and flying foxes are a.ttracted to their flowers. Leichhart Tree (Nauclea orientalis): These large shady trees, up to 30 metres high, grow in rainforest and adjacent wetter habitats of the region. They have large, broad, mostly smooth egg-shaped dark green leaves, and fragrant golf-ball size yellow and white flowers that are formed in dense globular heads on the ends of short branchlets. The globular, slightly course, soft yellowish-brown strong-smelling fruit that follows flowering is eaten by cassowaries and flying foxes.